So How Far Along Was Duke Nukem Forever Before It Was Binned? 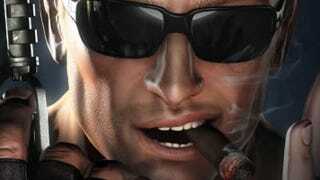 In 2009, Duke Nukem Forever was cancelled after over a decade in development. It's now famously back from the grave, but if you've ever wondered how far the original developers were from actually finishing it, Triptych president David Riegel has your answer. "When 3D Realms shut its doors in May, I would say the game was maybe about 75-80% compared to what it is today, but it was interesting because it was a kind of an uneven 80%", he said in a podcast on the official Duke Nukem site. "There were entire AI systems that were done, probably about 90-95% of the weapons were done in terms of effects and game play and entire sections of the game that are still around now—-a lot of the game is still around now; but it was missing some major things, like there was no…narrative script; there was no dialog; nothing written for any character." "Most of the characters didn't exist. NPC behavior didn't really exist, like no head tracking or eye tracking, no lip syncing, none of that. No music, no ending: there was a planned ending but it wasn't really there." Riegel was once working on the game before developers 3D Realms went bust, so he knows what he's talking about!